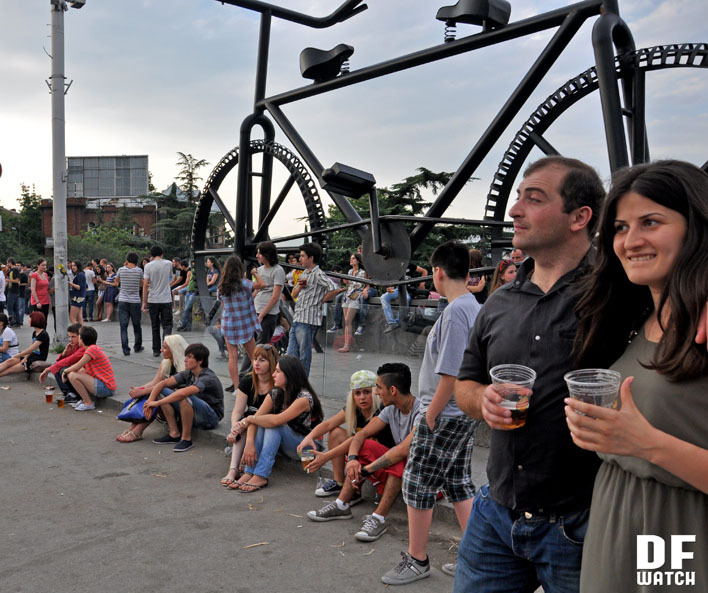 TBILISI, DFWatch–A beer festival was held this weekend on Roses Square in Tbilisi. The festival is organized by Georgian brewery Natakhtari. It has become a tradition and is held for the fourth time this year. Among the beer brands guests could taste were Czech Kozel, Turkish Efes, Georgian Natakhtari and Mtieli. Thousands came to taste beer and listen to bands like SvanSikh, LOUDspeakers, Zurgi, Salio and Zarebi. There was organized different kinds of entertainment and competitions for playing games or drinking beer faster than the others. Some people came with children, who had opportunity to participate in different activities. There were rows of tables where guests could sit down and enjoy Georgian ‘mtsvadi’ (barbecue) or other food and snacks with beer, while in the corners bales of hay were placed for people to sit down and enjoy the music. Guests complained about the long rows at the beer counters, as well as toilets, but others were happy to taste many sorts of beer and to meet and drink with friends.